Leaving the job as a program manager means that you are not much satisfied with it and you have acquired the better opportunity than that. There can be many reasons for leaving the job. Perhaps, you are not satisfied with the system of managing the programs in the company or you have got another job opportunity with better incentives. It is not necessary to tell the employer about your dissatisfaction. You can write a simple resignation letter stating that you have decided to quit this job. Giving a written resignation letter is one of the rules that you have to follow as long as you are the employee in that company. A resignation letter maintains a positive relationship between you and your employer. This relation is important because you may need your employer in future for reference. Moreover, the resignation letter also puts a positive impression that lasts forever. This impression is as important as the first impression. The resignation letter should be given to the person who has hired you. The start of the letter should be formal as well as friendly. Maintaining professionalism while being friendly is a bit tricky, however, this is what your resignation letter demands. Your resignation letter should clearly state your intentions of quitting the job. There should not be any confusion in the letter. 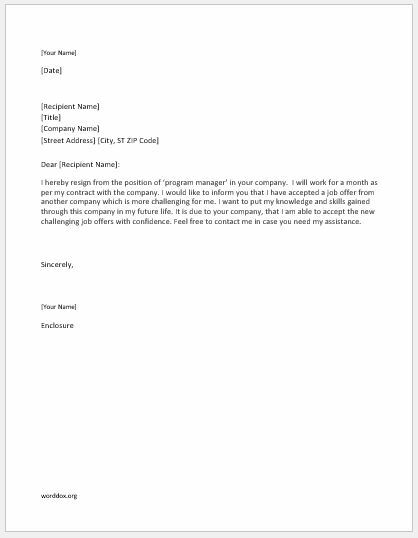 Below is the sample program manager resignation letter that will help you draft your personal resignation letter. I hereby resign from the position of ‘program manager’ in your company. I will work for a month as per my contract with the company. I would like to inform you that I have accepted a job offer from another company which is more challenging for me. I want to put my knowledge and skills gained through this company in my future life. It is due to your company, that I am able to accept the new challenging job offers with confidence. Feel free to contact me in case you need my assistance.